Everybody Talks About the Weather . . .
We watched this movie on DVD tonight. I've never read any of Nicholas Sparks's novels, and I think this is the first film based on one of his books that I've seen all the way through. It's about half of a pretty good movie. I'm a sucker for small-town, Forties Americana, and THE NOTEBOOK does a good job of providing just that for a while. The period details ring true, and the movie is well-photographed and looks great. But just when things are set up for a big, sweeping, epic yet personal story of the sort that Herman Wouk and Irwin Shaw did so well, the plot bogs down and never really moves its feet again. I try to avoid saying, "Well, the writer should have done thus-and-so, because that's the way I would have done it", because I didn't write the book, or the movie based on it. That wasn't my decision to make. Still, there are times when you see things that could have been and wish the author had gone another way. That's the way I feel about THE NOTEBOOK. There's an excellent essay by Richard Wheeler on Ed Gorman's blog today, about the differences between literary and popular fiction and how they came about. As someone who writes popular fiction, and pretty quickly, at that, I'm in agreement with Wheeler. 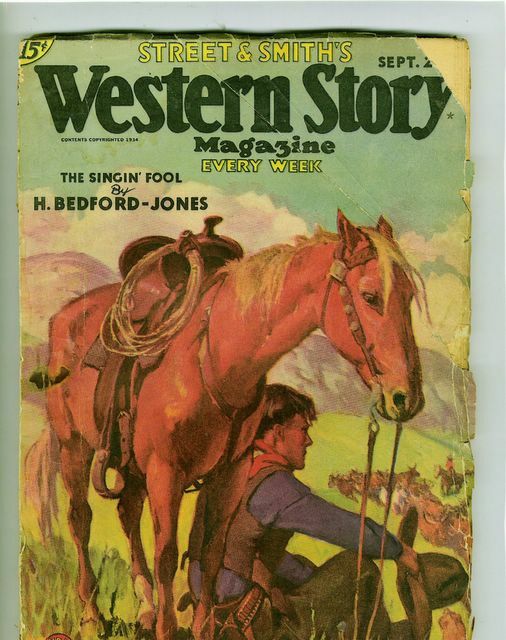 Some years ago, I took part in a seminar at Texas Christian University about Western fiction, the theme of which was "But Is It Literature?" Several working Western writers were invited, and we made the argument that literature is where you find it. The academics disagreed and seemed to be more of the opinion that literature is where they say it is. They were reasonably polite about it, though. Personally, I don't think I've ever claimed that what I write is literature. I try to turn out good, solid commercial fiction that my audience will enjoy reading. But that doesn't mean that I can't sneak in something every now and then that I think is worth saying. Lee Goldberg asks some questions in the comments below, so I thought I'd just make a post out of them. How many books do you typically write in a year? And how many words are they, on average? What does you wife do on the books? Is this a book you are writing together or does she proof it for you? Isn't she busy working on books of her own? On this book I did much of the original research and then we plotted the series together. James did most of the writing and we both proofed it. This is one that had both our names on the contract. I'll add that very few of the things I've written over the years haven't been worked on in one way or another by Livia. She's plotted entire books that she never got any credit for. And her editing generally saves me from at least one stupid mistake on every book. You mentioned you have a number of outlines to do. How detailed are your outlines? How many pages? I like a six to eight page outline. That's loose enough to allow for some improvisation but detailed enough so that I rarely write myself into a corner. But I've written plenty of books from outlines that are only a page or two long. Occasionally I'll write one with no outline at all, or maybe just a few lines, more a concept than anything else. I worked for a book packager that required lengthy, detailed outlines (I'm talking 60 to 70 pages). I hated that. On the other hand, one of my favorite writers, Richard S. Prather, supposedly did 75 page outlines for his Shell Scott novels. Whatever works, that's my motto. Anyway, THE HOT KID is pretty much a typical Elmore Leonard book. It has the things I like about his work -- the good action scenes and dialogue -- and the things that I don't like -- the style that's so clipped it's sometimes hard to decipher and the plot that meanders around so that it never seems to get anywhere. I think I liked this one a little better than some, though. Leonard does a good job with the period detail, putting in enough to make the era come alive without going overboard on it. There's also a decent ending that creates some genuine suspense rather than just petering out, as too many of the Leonard novels I've read have done. I saw on Sarah Weinman's blog the other day that Leonard's next novel will be a sequel to THE HOT KID. I'll probably read it, too. 12 pages today wrapped up the current book (#177 overall for me), and I'm very glad to be done with it. Livia still has some work to do on the manuscript, but it should be ready to turn in soon. I don't mind admitting that I've been using this blog as a self-motivational tool. I didn't want to have to report a bad day's output, so sometimes I worked a little harder as a result. Whatever works. I don't know if I'll continue reporting my page count. Depends, I suppose, on how the next book goes. I need to write two or possibly three outlines, but I'll have the next book started in a few days. We watched this movie on DVD tonight. Not surprisingly (I liked DAREDEVIL, after all), I also enjoyed ELEKTRA quite a bit. Of course, there's a good chance I could watch almost anything with Jennifer Garner in it and enjoy it. However, I'm not sure why the critics trashed this movie so badly. The plot holds together pretty well, the production values are good, the acting's not bad. It's an action-adventure movie based on comic book characters. It's not supposed to be CITIZEN KANE. But it is an enjoyable way to spend an hour and a half, and that's all I asked from it. First of all, this is not really my kind of movie (nothing blows up), and I knew that going in. I think it's good, though, to occasionally watch a movie in which nothing blows up, and I've kind of gotten to like Adam Sandler over his last few movies. He does a good job of playing a basically decent, befuddled sort of guy who would like to do the right thing if he could only figure out what it is. That's his role in SPANGLISH, too, and he's his usual likable self in it. Part of the problem with this movie is that the role of his wife, played by Tea Leoni, is written in such a relentlessly unsympathetic fashion that she comes off as totally unbelievable, and the movie sort of falls apart because of that. I know there are people who have absolutely no redeeming qualities whatsoever, but they don't make very good fictional characters. (Unless, of course, they're villains in pulp novels. I have no problem with that.) Also, a good rule of thumb is that any movie which consists of people sitting around talking about their feelings should not be more than two hours long, unless they're damned witty about it, which the characters in SPANGLISH are only occasionally. These comments probably sound a little too harsh. I watched the whole movie and stayed awake all the way through it, so that's got to say something for it. Back on the writing front, I got 25 pages done yesterday before it was time to go to the graduation. Just 10 today, but that just leaves me with a short final chapter to write tomorrow and I'm done with this book. The reason I only wrote 10 pages today is that we were out running errands for much of the day. One of my stops was a Goodwill store, where I went through the book section and found a few things of interest. I always enjoy browsing through the books at Goodwill stores. They're just jumbled up, in no order at all, which can be frustrating, but since the store relies entirely on donations for their stock, you never know what you're going to find. The first thing I picked up today was a Pocket Books edition of THE BEST OF DAMON RUNYON. It's the 21st paperback printing, from March 1944. The colors on the cover are still bright, the pages are white, and the book smells great. You paperback collectors know what I mean. I also came across Clive Cussler's THE MEDITERRANEAN CAPER, a later Pocket Books printing, not the rare and valuable Pyramid Books edition Bill Crider mentioned a few days ago, but I was glad to get it anyway because I want to read another Dirk Pitt book and this is the next one in the series. Then there's DARK MASTER by Raymond Giles, a plantation novel published by Fawcett Gold Medal in 1970. That's a genre I started collecting in a haphazard fashion because of Harry Whittington's involvement with it under the pseudonym Ashley Carter. I didn't have anything by Giles and thought I might as well invest the fifty cents. I also got one hardback, a 1945 Grosset & Dunlap edition (no dust jacket) of Erle Stanley Gardner's THE D.A. CALLS A TURN. I like everything by Gardner I've ever read, including the D.A. series. And this book smells just about as good as the Runyon book. Not a great haul by any means, but these days when it's getting harder and harder to find good, old books, I'll take what I can get. 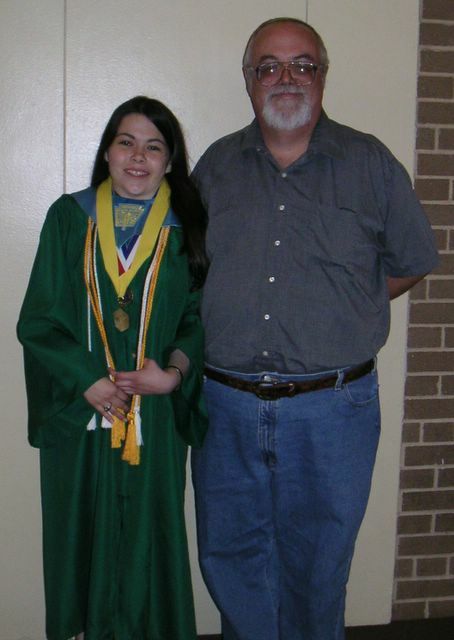 As promised, here's the graduate and her proud dad. I have to put on my proud dad hat tonight. Our younger daughter Joanna just graduated from high school, ranked 4th in a class of 371. The past few days, especially today, I've been pretty much swamped with pride, relief, and nostalgia. For the first time in 15 years, we don't have a kid in public school. That's the relief part. The nostalgia comes in because it just doesn't seem possible that she's old enough to be out of high school. She'll be off to college in the fall, and that'll probably seem even stranger. But right now I'm glad the ceremony is over and went off without a hitch. If I can get a picture off the digital camera tomorrow, I'll post it here. We haven't watched any movies for a while, so tonight we sat down and watched this one on DVD, and I thoroughly enjoyed it. Of course, I tend to like Jerry Bruckheimer-produced action movies starring Nicolas Cage. I thought both THE ROCK and CON AIR were great fun. So is NATIONAL TREASURE, and I think it's a little smarter than those other movies, too. Sure, a lot of the history stuff was hokum, but it was still enjoyable working out the clues. I also liked the fact that instead of a bunch of exotic locations, the story was set primarily in Washington, Philadelphia, and New York. And just to throw in a little trivia, Cage's character Ben Gates has the same name as a fictional private eye who starred in a series of Dell paperbacks written by Robert Terrall under the pseudonym Robert Kyle. I suspect the screenwriters never heard of the PI character, but I got a kick out of it anyway. I put the Flynn collection aside for the moment to read Elmore Leonard's new novel THE HOT KID. I'm not a big fan of Leonard's mysteries (I like his early Westerns a lot better), but I'm enjoying this one so far. A little of the style he uses these days goes a long way with me, though. Wrote 21 pages today, which is just the sort of nice, productive day I needed in order to get this book finished this weekend. I hit the library this morning and managed to find a research book I should have had all along for the current project. It told me pretty much everything I needed to know. However, it also told me that I had fouled up several things in the pages that are already written, so I had to go back and do minor revisions on earlier parts of the book and a fairly major rewrite on the stuff I did yesterday. This seems to be an occupational hazard of writing historical fiction. I'm lucky if I only have to do it once or twice per book. I did so much cutting and pasting and moving around and writing new linking paragraphs that I'll really have to edit that chapter carefully to make sure that it all still makes sense. Once that was done I was able to go ahead and write 16 new pages, which I almost certainly wouldn't have been able to do if there hadn't been a lot of shootin' and fightin' involved. (Action scenes are nearly always easier for me to write.) I've got my sights set on this weekend for finishing this book. I read a couple of stories in that Lumley collection and then said, nah, not my kind of stuff. I like some horror fiction quite a bit, but this volume didn't connect with me. I went back to the Flynn collection and am still enjoying it. I'm still reading that T.T. Flynn collection, but I'm thinking about alternating the stories in it with the stories in a Briam Lumley horror collection, FREAKS. I don't think I've ever read anything by Lumley, but I have several of his Necroscope novels and keep thinking that I'm going to get around to them. As expected, I finished reading Michael Connelly's THE POET last night, but it was too late for me to write about it coherently. So I'll make my comments today. I liked this novel quite a bit (even though I think the Harry Bosch books are better). As I mentioned, I don't like it when an author switches from first to third person, but Connelly doesn't overdo the technique and it serves a legitimate purpose in this book. The things I enjoy about Connelly's work are the stripped-down yet lyrical prose and the way he handles the complex plots. Nobody I can think of these days is better at peeling back the layers of a story one by one. As for the infamous ending of this book . . . well, I had the killer's identity pegged all along (although there's no way to prove that, of course), so it didn't come from too far out in left field as far as I'm concerned. I've figured out the killer's identity in five out of the six Connelly books I've read so far. That doesn't make me like them any less. I think it's just a matter of reading several of them pretty close together, which gave me a good handle on how he sets up the plot and the pacing of his books. I'm sure he'll surprise me as I continue reading his work, which I'll definitely do. After finishing THE POET, I started another William Colt MacDonald Western, but I didn't care for this one so it's going back on the shelf for now. Maybe another time it'll appeal more to me. I moved on to PRODIGAL OF DEATH, a collection of pulp Western stories by the always entertaining T.T. Flynn and as usual I'm enjoying his work. On the writing front, I turned out 12 pages yesterday and 14 today, so it's coming along pretty well. The forecast for tomorrow's high temperature in these parts is 100 degrees. Today it was a cool 98. Temperatures this warm in May aren't unheard of in this part of Texas, but they're not common. Usually, we don't hit triple digits until late June or so. Yesterday I had to go to Dallas on family business, so after fighting the traffic over there and back, I didn't feel like writing any. Tried to make up for it today and got 28 pages done. I'd like to get another good day tomorrow so I'll have a nice productive weekend. I'm still reading THE POET, but I ought to finish it tomorrow. I don't have as much time to read as I once did. Here's the cover of my friend Jim Griffin's new book. 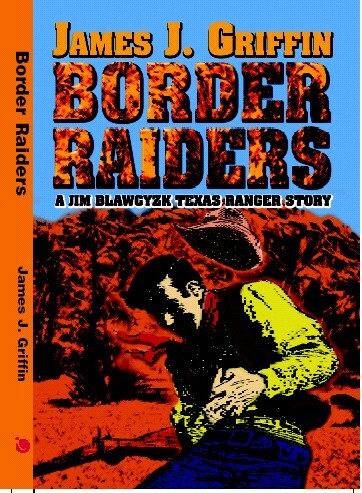 I enjoyed the last one, TROUBLE RIDES THE TEXAS PACIFIC, and I expect to enjoy BORDER RAIDERS, too. Person, that is. I'm enjoying THE POET, although it seems to be taking me longer to get into it than it did with the Bosch books. Also, Connelly does something in this novel that's probably my ultimate pet peeve about writing: he switches back and forth from first person to third. I don't know why that bothers me, but it does. However, when the book is good enough -- and so far, THE POET is -- I don't mind the technique nearly as much. And ultimately, it's the writer's call, of course. The story needs to be told the way the writer wants to tell it. As for my own work, I was able to stick with it all day again and got 22 pages done. Like a horse heading for a waterhole, I'm starting to smell the end of the book. Still have a ways to go, though. There are the usual informative story introductions by Jon Tuska, also. Although it doesn't say so anywhere, this is sort of a theme anthology. Most of the stories deal with outlaws going straight or trying to keep their shady past from catching up with them. All of them are excellent. 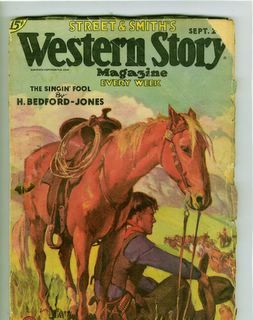 Peter Dawson (Jonathan Glidden) was one of the best writers in the Western pulps and always kept the purple prose to a minumum, although it sometimes creeps in during the gunfight scenes (not necessarily a bad thing). This is my favorite of the Dawson collections I've read so far. It'll probably turn up eventually as a Leisure paperback, and if it does, it'll be well worth picking up. I'm now reading Michael Connelly's novel THE POET. As long-time readers of this blog may recall, last fall I went on a sort of Connelly mini-binge, reading the first four Harry Bosch novels in fairly short order. I haven't read anything by him since then, though. But I'm in the mood for his work again and am enjoying this one so far. I was able to work on the writing most of the day and got 23 pages done. I also realized that some of my plans for the rest of the book aren't going to work, so I have to change gears and approach it a little differently. I still feel good about how it's going, though. Not that PACIFIC VORTEX was without its problems. Cussler's writing really shines in the underwater scenes, but his dialogue and the rest of the narrative is pretty clunky at times. Since this was a first novel, it may well be that his writing improved later. As it was, the pace moved fast enough and the plot was intriguing enough to keep me reading with ease all the way through. The plot was the standard madman-with-a-hidden-underwater-base-and-vaguely-science-fictional-gimmicks-and-weapons, straight out of Sixties secret agent books and movies. That's okay with me, though. I grew up on those plots and still enjoy them. Mostly Dirk Pitt is a likable character, managing to be a superman and a flawed human being at the same time. By the way, Bill Crider asks below if I have the first edition of Cussler's first published novel, which is apparently rare and very expensive on eBay these days. The answer is no. I don't think I own any of Cussler's books. PACIFIC VORTEX came from the library, and that's where I'll get the others if I read them. No pages yesterday, just too much else going on. Today I went over a copy-edited manuscript that had to go back to the publisher, worked some on the still on-going plumbing problems, and wrote 19 pages on the current project. As for reading, I'm going back to finish LONE RIDER FROM TEXAS, a collection of pulp Western stories by Peter Dawson (Jonathan Glidden) that I started a while back. Only six pages today, but I tell myself they were six good pages. One of the things about living out in the country is that people tend to dump unwanted animals on the road next to our property. That's how we've acquired quite a few of our pets over the years. It hasn't happened in a while -- until today. This afternoon we discovered a puppy living under one of our cars. He seems to be mostly chow and is very friendly and cute. A couple of our other dogs didn't care much for the idea of adopting him, but they seem to be adjusting to each other fairly well. There's been a lot of growling, but not much real snapping. With that as a distraction, I wrote only 14 pages today, but that's not too bad. The book seems to be rolling along at a good clip now, and I'm starting to be able to see how the rest of it will play out. It's going to be a little late, because it's due on May 20 and there's still just too much to do in order to finish it by then, but I think I'll have it in the editor's hands by the end of the month, so I hope that won't cause a problem. I'm still reading Cussler's PACIFIC VORTEX. Today I had what I think is a good idea for a novel, maybe one of the best ideas I've ever had. A book that would be fun to write and that also would have at least the potential for some success. Problem is, I don't have time to write it. Not even chapters-and-outline. It's enough to drive a guy nuts. I know that some of you reading this may be trying to sell books, and the last thing you want to do is listen to some jackass whine about selling too many. I apologize. But, dang, it's a really good idea. I'm going to at least write it down so I won't forget about it (like all the other great ideas I've had that are now permanently missing from my head). No pages to report today. Errands this morning, then this afternoon I had to crawl under our house to struggle with some plumbing problems. These problems have been on-going for the past couple of weeks and my annoyance and frustration over them contributed to my recent "I ain't gonna blog no more" snit. Those of you who have met me can easily guess that negotiating through a dark, muddy, cramped crawlspace is not something I'm good at. I couldn't do anything except attempt some stopgap repairs. Fixing things right is going to require a plumber. But at least I've seen the problem close up and can tell him exactly what's wrong. Plumbing and painting are the two household repairs that I hate the worst. Maybe I did a little bit of good, though. I finished this Stuart Woods novel tonight, and after not liking the last few books of his that I'd read, it was a pleasant surprise, an enjoyable story set for the most part in Hollywood in 1939. Woods captures that era fairly well without going overboard on period details and without any blatant anachronisms. The plot is a little thin -- movie studio troubleshooter has a series of run-ins with a mobster who works for Bugsy Siegel -- but the characters are likable (except for the villains, who are appropriately despicable), and the pace seldom slows down. Without giving away any plot details, it's pretty obvious this book is intended to be a one-shot, which is kind of a shame because the hero would make a good series character for Woods . . . as if he needed another series character, since he already has three on-going ones. I wrote 22 pages today, which surprised me a little because I spent part of the day running errands. Sometimes it goes like that, though. In my running around, I stopped at Half Price Books, and one of the things I picked up was a DVD of a Steve Reeves movie I'd never heard of, THE WHITE WARRIOR. This is some sort of Cossack movie from 1959, based on a novel by Leo Tolstoy. I'm not expecting much from it, but it was only a buck. I liked the Hercules movies starring Reeves when I was a kid and also liked MORGAN THE PIRATE, which starred Reeves as Henry Morgan. I haven't watched any of them in forty years, so I don't know how well they would hold up if I saw them now. Speaking of MORGAN THE PIRATE, I own the novelization of that movie, published by Dell and written by the old pulp author Robert Carse. I've never read it, but I might have to dig it out and do so. Including me. It’s been a mild spring in this part of Texas, unseasonably cool a lot of the time and not many storms. However, this morning it was hot enough, and humid enough, by ten o’clock so that we knew it was time to clean up the ol’ air conditioners and turn them on. It’s common to have to start using the AC during May, but some years we’ve had to turn them on in April. When I was a kid, heat didn’t bother me much. I remember playing football in the middle of summer when the temperature was well over 100 degrees. The older I get, the less I like the heat, though. I started watching the serial ACE DRUMMOND last night, but the print from which the DVD was made was so bad I stopped halfway through the first chapter. I’m thinking that I ought to take a break from serials, anyway. I have a bunch of those Dollar Tree DVDs with episodes of old TV shows on them that I need to watch, so I’ll probably switch over to those. Still reading THE PRINCE OF BEVERLY HILLS and still enjoying it. Who am I trying to kid? I'm hooked on this blogging stuff. I didn't even make it a full week! But I just couldn't stand the idea that somebody out there might really need to know that S.O.S. COAST GUARD is a very good serial, and I don't want to let them down. Ralph Byrd is Coast Guard Lt. Terry Kent, who's trying to prevent evil scientist Dr. Boroff (Bela Lugosi) from getting the ingredients to make a disintegrating gas. Terry fails at that (no huge surprise), so then he has to find the plant where Boroff is making the gas and keep him from selling it to agents from the evil European country Morovania. Other than the disintegrating gas, this is actually a pretty realistic serial, with lots of underwater action on the sunker liner Carfax (an in-joke for Lugosi fans). Lots of good miniature work and stunts galore -- boat stunts, airplane stunts, motorcycle stunts, car stunts, etc. Ralph Byrd is as jut-jawed and hyperactive as ever. Lugosi underplays and is very effective in his role, coming across as more of a ruthless businessman than a mad scientist. Although there is one scene where he's playing with a dog that's absolutely chilling, because we know that he's about to test his gas on the poor pooch . . .
As far as I'm concerned, though, the show is stolen by an actor I wasn't familiar with at all, Richard Alexander. After looking him up on IMDB, I see that he had a long but undistinguished career as a supporting player and bit part actor (he's listed as "uncredited" in most of the movies he appeared in). Evidently he's most famous for playing Prince Barin in the Flash Gordon serials. In S.O.S. COAST GUARD, he plays Thorg, the mute, hulking, tormented henchman of Dr. Boroff. It's a fine performance, conveying both menace and tragedy. This serial also has a slam-bang, very satisfying conclusion, unlike many that sort of just limp to an end. The photography is quite good, including an unusual number of scenes shot on location, and the direction by William Witney and Alan James keeps things moving right along. I highly recommend this one. I've tried to start a couple of serials since finishing S.O.S. COAST GUARD but haven't found one yet that I liked. I'll keep trying. I'm currently reading THE PRINCE OF BEVERLY HILLS by Stuart Woods. I've read and enjoyed quite a few of Woods' books, but I don't like the series he's been writing about lawyer Stone Barrington. I quit reading those books, in fact. But this is a non-series book, about a Hollywood movie studio troubleshooter in the late Thirties (I wonder if the character ever runs into Dan Turner or Bill Lennox), and since I really like books set in that era, I decided to give it a try. Only about a fourth of the way through, but I'm enjoying it so far. There. I feel much better now. 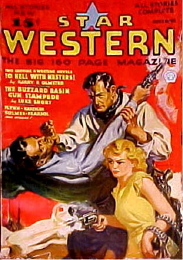 WesternPulps scan -- an issue of WESTERN STORY from 1934 (exact date not available). Thanks to Jim Griffin for this one. This blog is going away for a while, until some issues are worked out in both the writing world and the real world. I hope to check in every so often and post something interesting, but I doubt if I'll be back to doing any regular posting until sometime in the summer. Thanks to all the regular readers and to those who only pop in occasionally, too. I've discovered that the best thing about blogging, like most other activities, is the people you meet. I'll still be around some on-line. My email address is in my profile, and most of you probably already have it anyway, so don't hesitate to get in touch. Thanks again, and so long for now.